Last updated: January 04, 2003. Image designed and copywritten by Darlene. Image designed and copywritten by vikimouse. 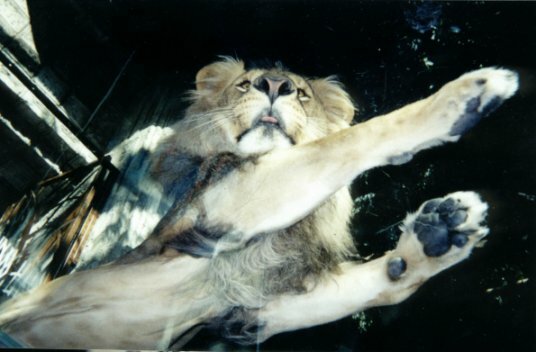 Dedicated to Sekhmet, a (potential) magazine article I wrote in March/April 2001 to fulfill a class assignment. I also made a quick trip out to the Temple for New Moon on March 24/25. Friday night was the official ritual. As always, it was a beautiful ceremony and a wonderful opportunity to visit with the men and women of the Las Vegas Pagan community... which seems to get larger and friendlier each year! It was especially good to discover that not only has Crone Witch Patricia found a Maiden (a lovely young woman called Crimson Tiger), but has also taken on several men as students during the past year, so look out ladies... Sekhmet Priests are on the way! Saturday I spent the morning at the Temple (nothing like "quality time" with Mom to get your chakras balanced and your energy flowing! ), then took a nice long hike during the afternoon, startling a HUGE jackrabbit in the process. Of course, I've never seen one in person before, so maybe he was just normal size. In which case... WOW! And to be honest, I think we actually startled each other. But Saturday night was really the highlight of the day... a Native American pipe ceremony! It was a deeply moving ceremony and I offer up my sincere thanks to Crone Witch Patricia for sharing her personal ritual space with us, and to Toni Vessels, the pipecarrier with whom I shared the guesthouse with that weekend, for allowing me to participate... and teaching me enough Lakota to offer up my prayers and thanks to the spirits of her tradition in their native tongue. Sunday morning found me back at Mom's knee (yes, I pretty much lived up at the Temple itself for most of my visit), then I headed back for an afternoon of visiting with CW Patricia and the other weekend guests (okay... and napping... all the energy at the site tends to lead to short nights) before joining Toni at the drum circle in Red Rock Canyon that evening. Yes, Virginia... the hippy and rave cultures are alive and well in Las Vegas... and they all get together to drum at Red Rock every Sunday night! It was a high-energy, well-run and friendly circle, but far too short since the rangers came to kick us out at dusk :-<. As the everyday world fades away, you find yourself standing in the cold darkness of a moonless desert night. The sky above glitters with innumerable stars, and off to the east you sense more than see the beginnings of the sunrise. Silhouetted against that deepest of blues is a cluster of small trees  an oasis  surrounding a domed, sand-colored structure. 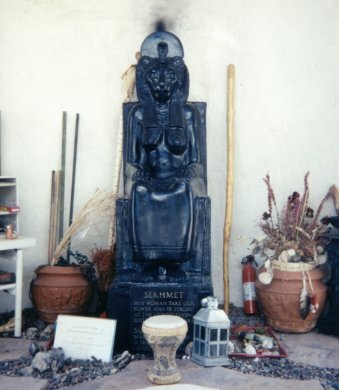 This is the Temple of Sekhmet, built to honor the Sacred Power of all Goddesses, and as you approach the temple grounds you feel the warmth of this energy surround you. There is a light breeze and in the trees around you you hear the gentle song of wind chimes, and in the dawning light you catch glimpses of brightly colored prayer flags fluttering in the branches. You enter  feeling the healing energy wash over you as you pass through the threshold -- and the quickly lightening sky reveals a slate and gravel floor, a central firepit, and a myriad of Goddess images from around the world. These images cover and surround the corner altars, and spill out onto the niches and shelves built into the walls. 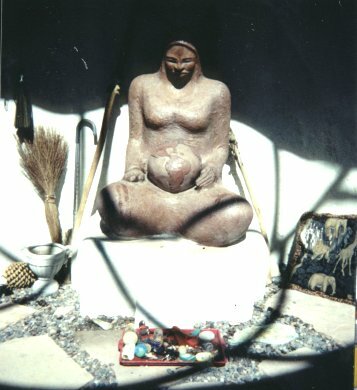 represented here by a human-sized basalt statue seated on a throne and holding an ankh  the symbol of life  in Her left hand. Her feline head bears the face of a lioness gazing lovingly at Her cubs, and Her human body is covered in a floor-length red dress. As your Goddess fades from the mirror, the image of you sitting in meditation in this sanctuary appears. The Goddess tells you that you may use this mirror as a gateway to return to the Temple and visit Her whenever you like.